Bison Panel is used as a thermal insulating floor, as a covering for under floor heating systems, hollow flooring, floating floors and mezzanine flooring. Oversize holes are to be drilled into the board for allowing expansion. The supporting rafters should be of non twisting type, since the screws may be forced out by continuous traffic loads. Curved and round supports are not permitted. No gaps need be given for board joints. They can be fixed flush. But, a gap of about 10 to 15 mm must be left on the periphery of the floor next to walls to allow for expansion. The gap can be concealed by a skirting board. When laid, the boards should be staggered lengthwise preferably by half their length, but at least by a third of their length from row to row; it does not matter whether they are cavity floors or floated floors. The joint between the boards must always be positioned over a support. In addition to screwing, it is better to bond the joints, with alkaline resistant adhesives as this will hold the panels more firmly together and increase overall rigidity. In order to avoid creaking, the edges will have to be provided with tongue and groove. The choice of either steel or timber supports depends mainly on the thermal insulation, fire rating and sound insulation requirements. The boards may be deep primed with a coat of primer and kept in dry condition. If damp boards are used for flooring, the water vapor will collect and will cause the floor coverings (PVC etc) to become loose from the boards. Light gauge steel sections like C studs 100 x 50 x 20 – 2.3mm thick or 150 x 75 x 20 – 3.2mm thick may be selected to have required strength as per the plan of the supporting RCC beam or R.S.Js provided in the structure. Place Principal Joist across the beams at 60 or 40 mm apart and common joists at 60 or 40 mm apart as required. Provide independent joists at the board joints. Fix boards only on the principal joists with a gap of 3 to 5mm. Fill the gap with Acrylic filler or Polysulfide. This will have a sliding frame effect and takes care of the movement in the board. Decorate the floor with lacquer spray, clear polyurethane or clear epoxy as desired. Recommended thicknesses: 20 mm or 25 mm. Light gauge steel sections of 2.3 or 3.2 mm thick may be selected as required. The Principle joists may be at 400mm or 600mm and common joists at 120 mm. Provide double frame at joint between boards. Provide control joints at 4.8m or 6m and also around the periphery of the room. Use elastic tile adhesive as per the user’s guide for fixing the tiles. Fill the tile joints with highly elastic filler. Avoid tile fixing on board joints. Control joints may be filled with polysulfide or elastic filler. It is better if a coat of water repellant paint is given on the back side of the panels before fixing the panels on the frames. When tile fixing is done with cement mortar. First a coat of water repellant paint has to be given on both the surfaces of the board. The tile fixing has to be done on cement mortar bed of 30 mm reinforced with wire mesh. Tile fixing in this case can be done on the boards joints also. Bison Panel is basically restricted to dry floor applications. However, occasional wetting will not pose any serious problems. The flooring can be finished with many kinds of floor coverings like tiles, PVC coverings, etc. Carpets made of synthetic fabrics, coir and jute can be used on Bison Panel flooring. When synthetic fiber carpets with an underside coat of impervious material is used, the board in the reverse side should be balanced with an appropriate covering. 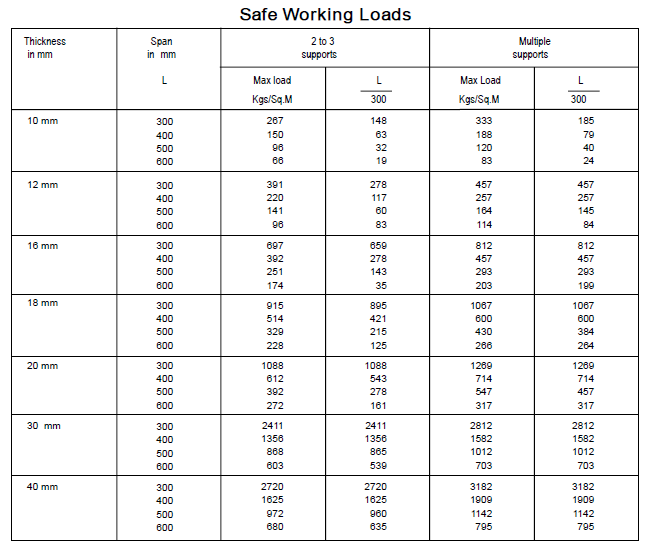 The working loads for different thickness of Bison Panel are given in the following table. As 610 mm is recommended as optimum span, loads corresponding to 600 mm may be adopted. The values given under L/300 correspond to safe loads allowing a deflection of 1 in 300 in the board.